O2 (UK) Archives · Stop the Cap! In one of the biggest ironies thus far this year, a British broadband provider trying to one-up the competition has started running ads with Dr. Seuss-like characters that represent marketing exaggerations, traps, and bad customer service, all while forgetting to disclose it engages in some tricks of its own. Once upon a time, when broadband was made, we browsed and surfed and chatted — everybody played. But for some, the magic faded. Some things started to go wrong. Without any warning, the niggles and nobs came along. 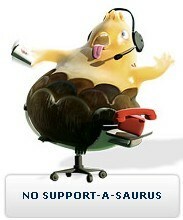 With the No Support-a-Saurus — spouting twaddle was his game. His impossible instructions would slowly knot your brain. 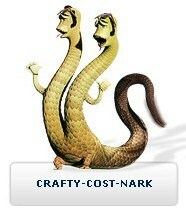 The Crafty-Cost Nark took pleasure in his work, delivering line rental bills that drove us all berserk. 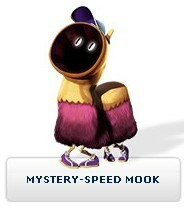 And with the Mystery-Speed Mook, you never really know. You thought you’d get mega-fast but got stuck with dead slow. But this is where we draw the line and try to right what’s wrong. Wouldn’t broadband be a better place, with narks and niggles gone? But accusing the others of broadband narks and niggles -you- see, without confessing your own is little more than hypocrisy. 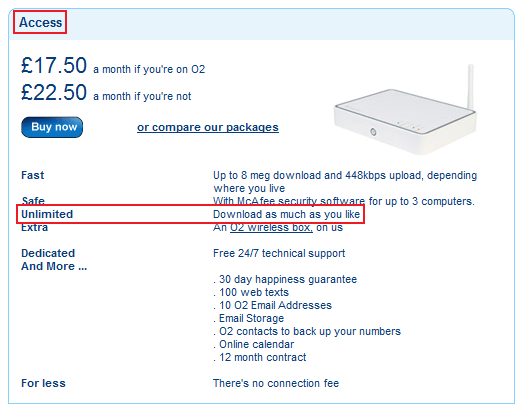 In a land of broadband O2 promises is not a dream, it brings to the table its own Internet Overcharging scheme. No nobble or niggle could ever believe, selling unlimited broadband -that wasn’t- was something they could achieve. But O2 managed — somehow, we don’t know, to define “unlimited” as 10GB per month — exceeding it brings woe. Maybe it's a typo that should have read, "download as much as WE like." 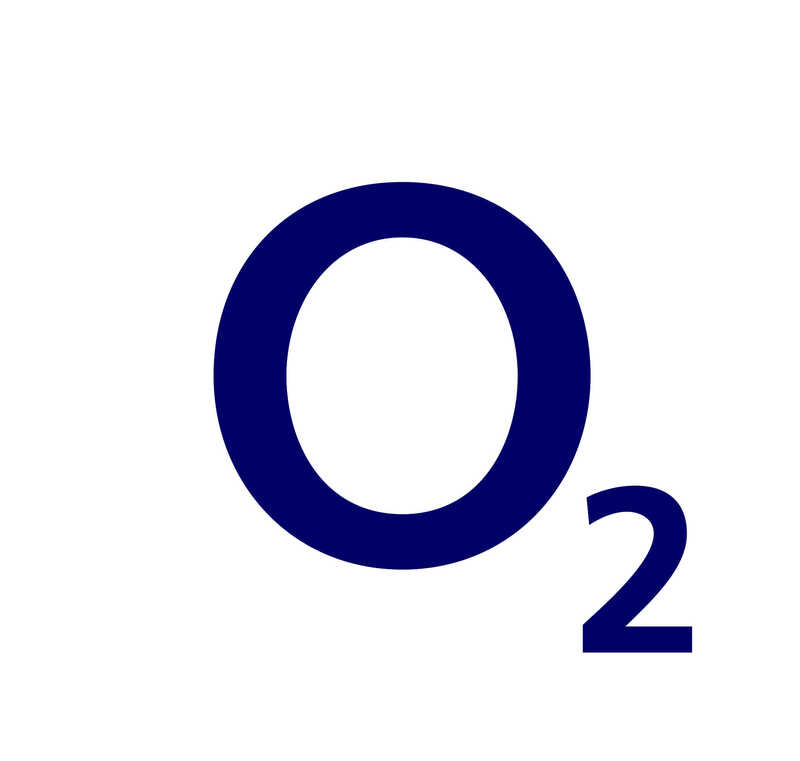 O2 sells its broadband packages across the United Kingdom, either bundled under a BTWholesale-based package or unbundled direct from O2 or BeBroadband. Only the BTWholesale accounts, common in rural areas where O2 doesn’t have its own equipment installed in the exchange offices, are impacted by the limit on unlimited. BT apparently charges them some form of consumption billing, and they aren’t willing to eat the costs. Starting in March, many customers started receiving letters stating they were using the service too much, and if they didn’t back off, they’d be disconnected. One customer received a disconnect warning after using 40.1GB, primarily from watching BBC’s iPlayer, which delivers on demand television programming. “Most O2 customers use less than 10GB a month. Aim for that and you’ll be okay,” says one of O2’s support pages on the topic. Outraged consumers arguing that “unlimited” should mean “unlimited” and didn’t comply were promptly disconnected. As some of you have been discussing, we’ve started to disconnect some of the very highest usage customers whose download patterns have detrimentally affected other customers’ experience, even after we have requested them to reduce their usage and explained the effect it’s having. We will continue this in order to improve the experience for the majority of the customers on the service. How much should I cut my broadband use? Most O2 customers use less than 10GB a month. Aim for that and you’ll be okay. Your product is unlimited, so why are you telling me to use less? There aren’t any usage limits on any of our O2 Home Broadband packages. That means you can download and upload as much as you like each month, within reason. Our network’s been designed to cope with people downloading large files (like music or films) and watching video online. But if you’re using the service excessively – like continually downloading large files at peak times – then we do reserve the right to warn you to lower your usage. In exceptional circumstances, we can even terminate your account. This is because excessive use by a few people can reduce the speed that other customers in the same area can get. We just want to provide everyone with an excellent level of service. Unfortunately for O2 customers, the company has not righted any broadband wrongs. They’ve added to them. O2 has an chronic problem with their own Niggles and Narks. Perhaps British regulators can do a better job exterminating them.